First and foremost, fireplace inserts and fireplace insets create a welcoming warmth in your home. What's more, an insert adds something entirely unique to the décor. An insert often gives a room simplicity and a streamlined effect. An insert typically becomes a natural gathering point, and the functionality and high quality ensure that you have a stove that will serve as your home's centrepiece for years to come. The Pharos Interior is a spectacular and organically styled fire. Because the fire is suspended from the ceiling, it enhances the impression of space in a room. 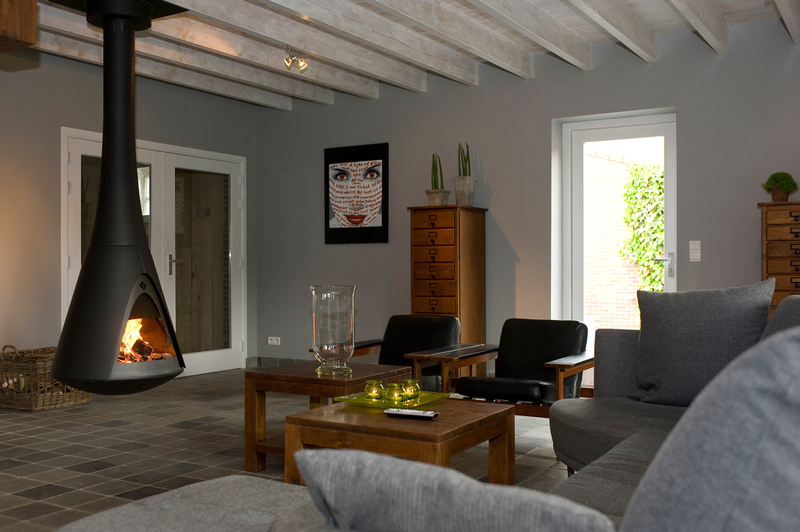 The centrally placed fire becomes a focal point and the stove becomes more than just a functional source of heat- it is also a work of art adding value to the space. Pharos Interior is set apart by its original design and by the ingenious construction which allows the fire to be suspended from a ceiling and to be fully, partly or non- rotatable as desired. The outer casing is made of high-grade cast aluminium. The interior is made of thick sheet steel and has a refractory base of ceramic material. The small glass window in the door opening is slightly curved, accentuating the organic form of Pharos. The fire is available in various colour combinations and is always made to measure for different ceiling heights. The Pharos is a triumph of the designer’s art with a smooth rotating action which allows you to appreciate the style and welcome the warmth from any angle. Design by Jos Muller. – Fixed, 2 x 60° or 360° rotation. – Sparkscreen is part of the stove. – Delivered with ash cleaner and cold-grip.